1974 TZ750 - Communication Plaza | Yamaha Motor Co., Ltd. This was the Formula 750 production racer developed simultaneously with the YZR500. The concept was the same as well and the engine was created on the idea of connecting two blocks of the 2-stroke, liquid-cooled, in-line 2-cylinder TZ350 engine together to make a 700cc in-line 4-cylinder engine and mounting it on a newly designed high-tensile steel pipe double cradle frame. 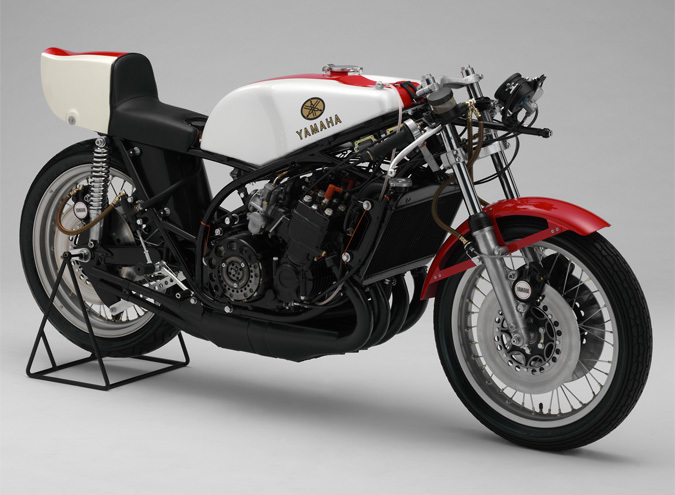 A factory spec TZ750 (0W19) won its debut race in the 1974 Daytona 200-mile Race ridden by Giacomo Agostini, and it also went on to be a winner on the Japanese and world racing scene as well.